The Bombardier CRJ200 seat maps for most airlines are very similar because there are not that many different configurations of the CRJ200 seat map. Below are the standard Bombardier CRJ200 seat maps that most CRJ200s are configured in. Below those two CRJ200 seat maps are more CRJ200 seat maps from different airlines (To be listed soon). Most Bombardier CRJ200 seat maps are configured with 50 seats and a seat pitch of 31 inches, except at the emergency exit row where CRJ200 seat pitch is usually 37 inches. Also the first row of seats listed on the Bombardier CRJ200 seat map may have more than 31 inches of seat pitch. 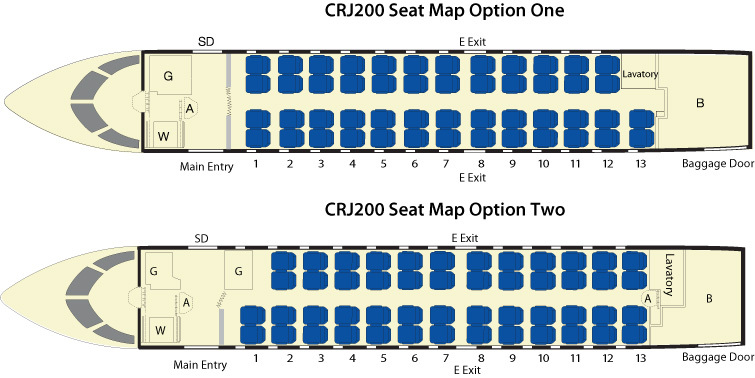 Above are the main two main CRJ200 seat map options. Most airlines have the above configurations for their CRJ200s. Bombardier CRJ200 seat maps from different airlines will be posted latter. The Bombardier CRJ200 seat map is also known as the Bombardier CRJ-200 seat map, Bombardier CRJ 200 seat map, Bombardier CL-65 seat map, Canadair CRJ200 seat map, CRJ200 aircraft seat map, Bombardier CL-600-2B19 seat map and the Bombardier CR2 seat map.